Please, don't be like me. I was naive enough to watch this movie, while I hadn't seen any of the previous two 'Bunnyman' movies. Not sure if they clarify much (they probably don't), but it made watching this movie a quite confusing one and a real task at parts. 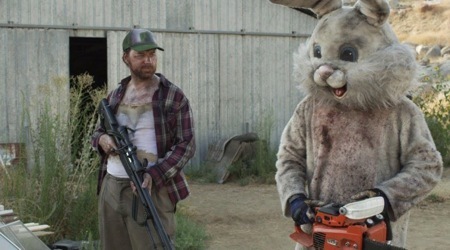 You would think that a movie with a premise of having a killer walking around in a bunny-suite would be one that would be fun to watch. Especially also when looking at the title and cover of the movie. This movie however takes itself surprisingly serious. This isn't really a complaint, since it of course remains something that could work out very well for a movie, but it in this case definitely feels like the movie is missing the mark with it. The movie tries to be something that it simply isn't. It is trying to be a bit of a clever and different movie, by taking an unusual approach to its story and concept. No doubt in my mind that this movie series got heavily inspired by "Donnie Darko" and the Frank character in particular. It doesn't only feature similar story aspects and characters, it also tries to mimic its style a bit. It is somewhat of a trippy- and in a lot of ways more like an art house movie, that however, as I mentioned before, lacks any sort of depth or truly interesting ideas to let its story work out. I just didn't get the 'world' and characters of this movie. Was the bunny suppose to be some sort of metaphor for someone or something? Throughout the movie I kept thinking 'yes', but after having finished watching it I have to say 'no'. There is no bigger or deeper idea behind anything, even though the movie itself still seems to think that it does. It is not an absolutely terrible movie to watch, but it definitely isn't a very pleasant one neither. Especially those expecting to get a fun slasher need to think again, before they actually decide to watch this movie. It is never really any fun and it also isn't much of a slasher neither. It is weird, since the story and movie most definitely feature lots of slasher elements and moments in it. Perhaps it is because they are handled so differently and because it never really seems to be the heart and center of the movie. The gore and slasher elements aren't even much good. The blood is incredibly fake and it actually was surprising to see how incredibly amateur-like this movie became once it started to feature some slasher elements in it. The movie in general feels and looks a bit too amateur-like at parts. The sound gets quite horrible, the editing sloppy and the acting is definitely below par most of the time as well. Thing with this movie is that it also really doesn't feature any likable characters in it. It is part of the reason why it just isn't a very fun- but also never a very interesting movie watch. Each and every character in this movie is a quite flawed and despicable one, without much redeeming qualities. It also really doesn't help that the movie doesn't really feature a main character in it, next to its Bunny character, that I still don't really understand or got to know anything about. There is no hero, no clear villain, no love interest. It is a very unique and different movie in a lot of ways, but unfortunately most of those ways aren't very positive or much good to watch. Aside from me not 'getting' this movie, I just can't say how anyone else could- or possibly could ever enjoy and appreciate this movie.